Whether you’ve just used and emptied a fire extinguisher, or if it’s coming up to its expiry date, it’s important to think about how you’re going to dispose of it. Firstly, never get rid of a fire extinguisher by just throwing it away. The pressurised container is potentially dangerous if crushed. In some regions, local authorities and privately owned recycling centres will accept fire extinguishers. Depending on the extinguisher type, as each extinguisher contains different substances and the chemicals used can be harmful if dumped. Businesses have a statutory duty to get rid of their extinguishers correctly without polluting. The extinguisher type is what determines how you should go about disposing it. AFFF foam should only be discharged into a sealed drain, as to prevent contamination of groundwater. ABC dry powder can be safely incorporated into landfill, preferably in sealed containers, although it is biodegradable. It’s best to send CO2 and other chemical based extinguishers for recycling as the contents could be recovered and reused. The only extinguisher safe for discharge into open drains or land are water extinguishers without any additives. The only extinguishers with strict disposal requirements are the old halon extinguishers, which have been banned since 2003. You should seek professional advice for the disposal of halon extinguishers. Halon has been linked to ozone depletion and is now a restricted substance. These canisters are colour coded using British Racing Green, and so should be easy to identify. 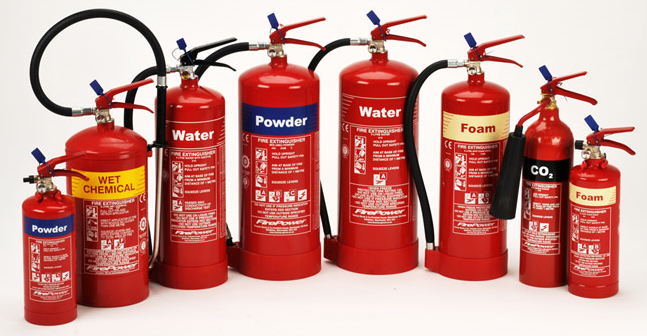 A substitute for Halon extinguishers is the Carbon Dioxide (CO2) extinguisher. For more information or advice on fire extinguisher disposal, contact Ace Fire for a complete fire protection solution.